South Gloucestershire Council launched a new Time 4 Reading schools award scheme on Thursday 16 July, which aims to promote the enjoyment of reading across school communities. The scheme’s launch was held at Wick CofE VC Primary School, where pupils were joined by the Chair of South Gloucestershire Council Cllr Erica Williams and Chair of the Children and Young People Committee Cllr Jon Hunt. 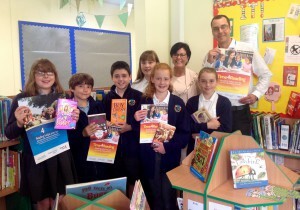 Cllr Hunt said: “Good reading skills are essential not just to young people, but to everyone in today’s society. Being able to read underpins education and accelerates our chances of success. Reading provides pleasure, enjoyment and inspiration as well as helping us to understand the world. It’s also important that children see their parents or carers and other adults reading, enjoying books and talking about them. The Time 4 Reading schools award scheme is open to all primary and secondary schools in South Gloucestershire. Schools taking part progress through a list of specified goals arranged in to bronze, silver or gold categories. To achieve the awards, children and the wider school community must read a set number of books and organise various activities to promote reading. Goals include encouraging reading at home, reviewing books and films and supporting initiatives such as the Concorde Book Award, with activities including organising book clubs, book swaps, story times and reading workshops. Participating schools are supplied with Time 4 Reading resources which include posters and specially designed bookmarks to record their progress. Award winning schools will receive a certificate for each stage to recognise their achievement.